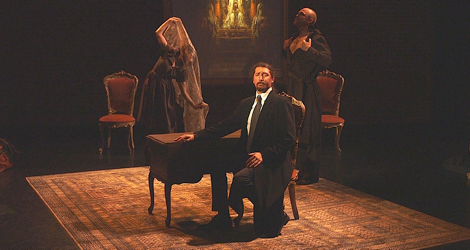 In 2013 Coleman Lemieux & Compagnie presented a hybrid of dance and opera directed and choreographed by James Kudelka called From the House of Mirth, based on the 1905 novel by Edith Wharton. This year CLC is presenting another work in the same genre also directed and choreographed by James Kudelka. This time the work is based on the 1884 novel À rebours (Against Nature) by Joris-Karl Huysmans (1848-1907). Just as the two novels are quite different so are the works based on them. From the House of Mirth was about a woman’s fall from high society and naturally had a large cast. Against Nature is essentially the a catalogue of the thoughts of one man and, though it has a cast of three, feels rather more like a staged song-cycle than a full opera. It is, nevertheless, exquisitely performed and in many ways feels more complete as a music theatre piece than did the earlier work. The central character of Against Nature is the aristocrat Jean des Esseintes, who has led such a decadent life in Paris that he has become disgusted with human society and flees to a villa in the countryside near Fontenay-aux-Roses to live in solitude. He arranges his schedule so that he never sees his servants, but should that occur, has them dressed as if in a convent. He is ill both as a result of aristocratic inbreeding and because of his previous life of riotous living. À rebours simply means “in a contrary direction” in French but the novel is translated as Against Nature in English to give a sense of what des Esseintes is contrary to. He believes that “Nature has had her day” and that what “human genius” can create is now superior to what Nature can do. Des Esseintes therefore sets about to create a perfect world of art and artifice for himself in his villa with everything from the interior décor to his books to even the interior smells chosen to stimulate his senses. Des Esseintes’ desire to live in isolation solely in a world of art has two inherent flaws. First, he may have left society and his past behind, but there is no way he can leave his memories behind so that he is plagued with reminders during the day and nightmares at night of his past life. Second, his desire to live in a world of art is also a desire to live in a world outside of mortality, of which his continually declining health is an inescapable reminder. It’s no surprise that the novel said to have poisoned the mind of Dorian Gray in Oscar Wilde’s novella about the callous unaging young man has been identified as Against Nature. It is extremely ironic that Huysmans’ novel that depicts the ultimate failure of his hero’s project should have so have so inspired the leaders of the Aesthetic and Symbolist movements who seemed to celebrate only des Esseintes’ aesthetic project rather than its outcome. Or, it may be, that the ultimate futility of living “against nature” was part of the secret thrill of doing so. with increasing information about the character’s deteriorating mental and physical health, so that we feel that the more des Esseintes tries to escape nature and morality the more he is unwillingly subject to it. The show has overtly comic elements derived from some of des Esseintes’ more bizarre experiences. Signalled by a shift in James Rolfe’s score to a jauntier music hall style, these scenes include the attempt by des Esseintes (Alexander Dobson) to improve on nature by encrusting a tortoise (Laurence Lemieux) with precious gems only to have the creature die because of the added weight. Another is des Esseintes’ journey to England, where he dines in an English restaurant while awaiting the boat-train only to give up the trip because he feels that seeing the real England after this will only be a disappointment. A third example is when des Esseintes recalls an affair he had with a female ventriloquist played by Lemieux using a doll. Against Nature is really a showcase for the formidable singing and acting abilities of baritone Alexander Dobson. His voice is beautifully warm and multi-hued. Rolfe’s sensitive score and Poch-Goldin’s imaginative libretto allow Dobson’s character to cover a huge range of emotions in just an hour – from satire and irony to disgust, joy, ecstasy, depression and resignation. Dodson is such a fine actor and has such immaculate control of his voice he can colour his tone to convey multiple nuances in every line. Since Against Nature is so tightly focussed on only one character, the work on its own could be a success simply as a contemporary song-cycle. Nevertheless, the work gains immeasurably through being staged. Director and choreographer James Kudelka has added two characters to play des Esseintes’ Servants, one male (bass-baritone Geoffrey Sirett) and one female (dancer Laurence Lemieux). They initially are clad in monk-like garb, as per their master’s instructions, as is the onstage piano trio that accompanies the piece. At first Kudelka has the Servants preform duties of helping their master in a ritualistic fashion. Gradually, as des Esseintes establishes his new way of life and becomes subject to memories, Kudelka gives them increasing prominence as they act out events their master discusses or become personages from his past. The first remarkable example occurs when des Esseintes is discussing his enjoyment of Gustave Moreau’s painting of Salomé (1876). Sirett transforms into Herod, Lemieux becomes the lasciviously whirling Salome and in a surprise move the song and dance end with a tableau where Dobson’s head become that of John the Baptist, thus cleverly uniting the themes of art and death at once. Lemieux, with red knickers under her black servant’s garb becomes any of des Esseintes’ previous lovers, while in one disturbing scene Sirett becomes a priest at the Catholic school des Esseintes attended who sexually abused him. All three performers are required to dance – Dobson the least, Lemieux the most – but Kudelka has minutely choreographed even the non-dance movements of all three. What will surprise many is that Sirett basically becomes Lemieux’s dance partner, graciously making all the moves that she does, leading in the ballroom sequences and performing lifts. A frequent trope Kudelka employs is to have Dobson become entrapped in the movements of the dancers, thus reflecting the way des Esseintes becomes more entrapped than liberated by his villa of art and ultimately ensnared by illness and death. Sirett, with his deep, dark but agile voice, often serves as the narrator of events to announce transitions between the work’s fifteen scenes. Lemieux wonderfully inhabits with expressive physicality a myriad of characters from the unfortunate tortoise to lascivious women. One complaint would be that except for her appearance as Salome, she is not given another solo to display her grace as a dancer. A appropriate place for such a solo could have been the scene when des Esseintes goes into ecstasies over the various perfumes he possesses. If Vítezslav Novák could write a ballet Nikotina (1929), where a woman embodies hallucinatory effects of snuff, then Kudelka could surely have Lemieux embody the ineffable delights of various perfumes. Lemieux, nevertheless, displays an amazing suppleness of body when Sirett and often both Sirett and Dobson manipulate her into various strictures from which she, like the essence of life and art, escapes almost in liquid form. While watching the risk-taking artists of Against Nature one can’t help but think that if opera wants to engage its audience more fully, opera singers will have to learn to move as expressively as they sing. James Rolfe’s music is written very clearly as accompaniment, setting rhythms and tones but never competing with the voice. Indeed, some of the most effective sections of the work consist of a single sustained note on the violin or cello serving a drone against which Dobson intones a chant-like account of his realizations. The playing of the piano trio under music director Steven Philcox is beautifully restrained and the musical impact of the whole is very like an impressionist painting. Enhancing the movement and dance, Jeremy Mimnagh’s sequence of projections onto a magic picture frame on the back wall provides not only visual references to artworks des Esseintes mentions but also commentary through other pre-existing images or through his own kaleidoscopic video compositions reflecting the ideas and emotions that des Esseintes experiences. As with From the House of Mirth, Against Nature is one of the most successful and most complete mergings of the arts of song, dance and visual art that I have seen. A theatre piece based on Huysmans’ novel could easily slip into a catalogue of pointless eccentricities. 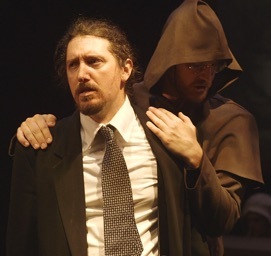 Here with Poch-Goldin’s libretto, Rolfe’s music and Kudelka’s direction and choreography, the bizarre life of Jean des Esseintes becomes a metaphor for the relation between art and nature and the struggle of mankind for immortality in this world which by its very nature offers only mortality and death. Against Nature is a fascinating, beautifully executed work which deserves to find a wide audience. Photos: (from top) Laurence Lemieux, Alexander Dobson and Geoffrey Sirett; Alexander Dobson and Geoffrey Sirett; Geoffrey Sirett and Laurence Lemieux. ©2016 Jeremy Mimnagh.